Kinney : Variant of the Scottish Patronymic name Kenney derived from the Gaelic given name Cionaodha , of unknown origin, but likely composed of the elements cion = respect + Aodh = pagan god of fire. Occasionally Kenney is derived as an Irish Patronymic name through the Anglicizing of O'Coinnigh -- 'descendant of Coinneach . Variations are McKinney, McKenney, McKenna, McKinna , and McKennan , among others. MacKinney: "This name is numerous in Ulster today; it is mainly found in counties Antrium and Tyronne. It is far more numerous now that it was a century ago - in 1866 there were 9 MacKinney births registered and in 1890 there were 42. The reason for this most unusual increase is that there has been a continuous tendency for the Scottish Mackenzie to become MacKinney in Ireland and it has also been used as a synonym of MacKenna. MacKinney is also the name of a sept of the Clan Mackinnon." More Irish Families, Edward MacLysaght, Dublin, 1996, page 139. 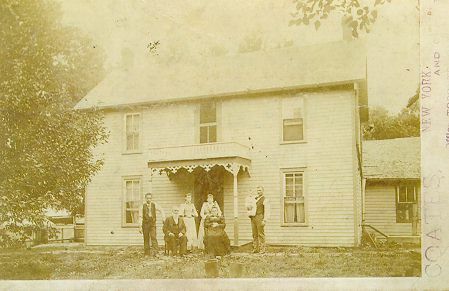 John Kinney was a well respected member of the Irish settlement in Dora Township. Several of the Irish families appointed him executor of their wills. The Kinney farm of 160 acres was located just east of St. Isidore Church. The farm area was often referred to as "The Kinney Corner". John was one of the original sixteen founders of St. Isidore Church in Bethany, Illinois. John Kinney & Mary Bresnan were the parents of Edward Kinney who married Emma Henneberry and Daniel Kinney who married Lizzie Henneberry. Mary Bresnan was the daughter of Edward Bresnan and Mary Twohy. See the Bresnan pages on this site. John Kinney died Friday evening about 5 o'clock at his home one quarter of a mile east of St. Isadore Church. His death was the result of injuries sustained in a run away the day before. Thursday, he was engaged in pulling hedge with a traction engine. When driving to a well to fill the tank, the mules hitched to the tank, ran away overturning the tank which fell upon Mr. Kinney and was dragged over his body. As he was able to walk to his home and seemed to be but slightly hurt, no danger was anticipated until Friday afternoon when in act of taking a glass of water he fell to the floor in a faint. Father Dougherty was called and administered the last sacraments. When Dr. Davis, who was phoned for, arrived life was extinct. Mr. Kinney's wife died suddenly about five months ago. He leaves five sons and three daughters, Edward, Dan, Will, John and Nean, Mesdames P. Fogarty, and L. Bolanger and Sister Isabella of the Ursuline Convent, Collinsville. He retired from active farming some years ago. He was about 73 years old. He was born in Ireland but came to America when quite a young man. He had many friends and, what can be said of very few, no enemies. He was noted for his honesty, his generousity and his charity. The funeral was held Sunday at 10 a.m. at St. Isadore's Church and was largely attended. Rev. J. J. Dougherty officiated. The regular choir under the directorship of Miss Lizzie Conlin furnished the music. The pall bearers were Bryan Conlin, John Fitzgerald, David Henneberry, Patrick McCaughey, Michael Griffin and James Smith. The many friends of Mrs. John Kinney were greatly shocked last Wednesday morning when the news of her sad and sudden death was announced. The family being unable to wake her, called Father Doughterty and Dr. Loesch. Both gentlemen pronounced her dead. Heart trouble was the cause of death. Mrs. Kinney was one of the best and most favorable known member of St. Isidore parish. She was noted for her many fine qualities, especially for her gentleness and charity. She had a most sympathetic soul and a place in the heart for all. Mrs. Kinney was born in the county of Limerick, Ireland in 1835. She came to this country 52 years ago and has lived near St. Isidore's church for the past 45 years. The funeral service was held at St. Isidore church Saturday morning and was conducted by the rector, Rev. J. J. Doughterty. Miss Agnes Dugan, assisted by Mrs. Dan Bresnan, John Nolan and St. Isidore's choir furnished the nusic, "Near My God to Thee" was sung as the funeral procession left the church. The church was more than crowded by her many friends, all of whom were moved to tears by the remarks of Father Cougherty, who himself was greatly affected. The pall bearers were David Henneberry, Jim Fogarty, William Delahunty, James Munson, M. Ryan and M. Nolan. The interment was in St. Isidore cemetery. #47-46: John Kinney age 35 born in Ireland, Mary Bresnan Kinney age 31 born in Ireland. 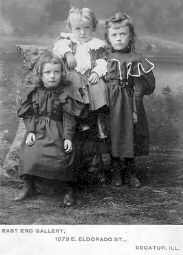 Children: Cornelius age 9, Edward age 7, Daniel F. age 5, Mary A. age 2. All children born in Illinois. # 91-91: John Kinney age 45, Mary age 40, children: Cornelius age 18, Edwin age 16, Daniel age 14, Agnes age 12, Cecilia age 9, Lucy age 7, Ellen age 2. 1890 Moultrie County Census: #166. 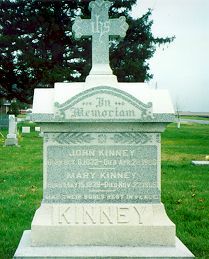 John Kinney, b. June 1834, age 65, Mary, b. May 1838, age 60. Cornelius: born Jan. 16, 1861 in Dora Township; died March 10, 1910. Agnes( Mary A. ): born Nov. 26, 1867, died July 17, 1927. Married Patrick T. Fogarty. 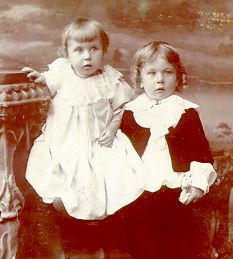 Son: Patrick Vincent Fogarty born Oct 19, 1902. Baptized in Sacred Heart Church on Oct 24, 1902. Sponsors: William and Mary Fogarty. Ellen: born April 16, 1878, died May 8, 1885. 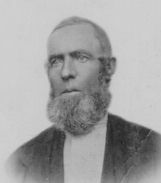 Edward Kinney (husband of Emma holding Ray). married Edward Kinney on Oct 11, 1892 in Sacred Heart Church in Dalton City, IL. Emma was 24 and Edward was 28. Priest was Rev. J. J. Clancy. From the 1918 Prairie Farmers Reliable Directory: "Kinney, Ed (Emma J. Henneberry) Ch Ray J., Eva M., Leo E., Elizabeth A., Tresa R., Ambrose D. (address) Morrisonville Rt. 6; Bear Creek Township Sec. 18. Owns 340 acres (1908 when moved to county) owns a Buick." Mrs. Ed Kinney dies at home 6 miles NW of Palmer at 7:30 AM today, of heart disease and grippe. She was the daughter of James Henneberry born near Wilmington on Oct. 24, 1866. She married Edward Kinney at Dalton City. Six children survive: Ray and Leo on farms near Palmer. Eve, Elizabeth, Vinola and Ronella all at home. Three sisters and one half-brother. Edward Kinney, 62 residing 5 miles NW of Morrisonville died at 11:15 last night in St. Vincent hospital, (Taylorville) where he was brought Thursday PM. He was injured Wednesday. He fell from a six foot step ladder striking his head on a concrete sidewalk. He had been trimming vines. He never regained consciousness. He was born in Oakley, Illinois on July 13, 1863. Survivors: Ray of Granite City; Leo, Morrisonville; Eve, Elizabeth, Ronella and Ambrose all at home. Brothers Dan of Decatur and William of Cayle, Alberta Canada. One sister Mrs. Pat Fogarty of Dalton City. Elizabeth A. age 10; Ronella T. age 8; Ambrose D. age 6. Eva M. Kinney: Nov 8, 1894-Dec. 1964. Never married. Ronella T. Kinney: Nov 1, 1900-May 1974; Never married; died in Decatur, IL. Baptized in Sacred Heart Church in Dalton City on Nov 29, 1900. Sponsors: David and Mary Foley. Ambrose D. Kinney: Sep 11, 1903-August 2, 1963. Baptized in Sacred Heart Church in Dalton City on Sep 20, 1903. Sponsors: James and Elizabeth Henneberry. Note: None of the three daughters married (Eva, Elizabeth & Ronella). Eva lived and worked in Chicago. Elizabeth was an office manager for Burk's Pumps in Decatur, IL. Ronella was an elementary teacher. Ray Kinney & wife Annie. With the exception of Ray, the above children are buried in St. Maurice Cemetery. Lizzie's first husband, Lewis Dunn, died July 24, 1903. 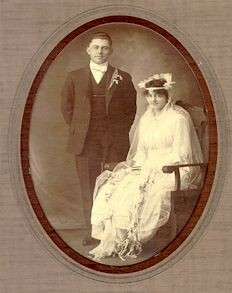 Lizzie married Daniel Kinney on April 6, 1907 in Dalton City, IL; Lizzie was 37 & Dan was 43. Daniel Kinney: born July 18, 1865 in Oakley, IL. died: June 27, 1928 in Decatur, IL. Physician was Roy Johnston of Decatur. Funeral Home was J.J. Moran & Sons. Cost of funeral was $543.50. Buried in St. Isidore cemetery, Bethany, IL. William P. Kinney. born Sep. 1879, died 1929. Married Anna Theresa Dunn in 1911. Parents of Anna: Peter Dunn and Mary Ann Nolan. Lived in Alberta, Canada.